The 3Dimensional Coaching course for certification contains the same modules, learning objectives, videos, quizzes, exercises and planning tools as the standard version. It also provides additional faith-based content at the end of each module provided by FCA, a “Level 3 Partner” of the 3D Institute. Click “Register” if you have a pre-paid registration code. Upon completion of this course, you will be emailed a copy of your coaching plan. You will also be mailed a hard-copy of your 3Dimensional Coaching certificate that has your personal transformational purpose statement inscribed upon it. Companion Study Guide: This spiral-bound book covers all 25 modules and reiterates key teaching points from the online training. This resource provides a handy place to take notes as you journey through the 3D content. It also provides thought provoking questions that are designed to be used in small group settings where the content can be processed and discussed by coaches who are going through it together. Companion Bible Study: This spiral-bound book serves as a discussion guide to help build upon the content of the online training from a faith-based perspective. This resource was produced in partnership with FCA, a “Level 3 Partner” of the 3D Institute. **Check with your district, club, or governing organization to find out if this course can be counted towards CEU’s or other professional development requirements. If you need college credit for taking this course, click here. I believe coaches of all backgrounds and levels can get something out of this course! It encourages deep thought and assessment of current practices, which will be useful moving forward in my coaching career! Excellent, really opened my mind. I would definitely suggest this course for coaches and especially new coaches to help develop their ability to coach. I enjoyed this course because it really broke everything down to help you understand every little detail and help me understand how important coaches are to our society and future. This course has breathed life into my own life as a coach by helping me to discover why I coach but then also by equipping me to be able to coach how I need to coach to fulfill that very same why. I loved this course it was very fulfilling. This course was a great help. It really opened my eyes to what is important as a coach and in life. I learned how to relate and understand a my team better as a coach and how to help them be successful in life overall. I recommend to others who would want this experience. "Excellent professional development for anyone in the coaching business"
it was fun learning the deeper meaning of coaching. I absolutely loved the course and learned a lot from it. I loved this course and I have learned a lot from it! I thought this course not only taught great values and strategies of coaching, but it also was presented in a form that was easy to learn and retain. This course is life changing. 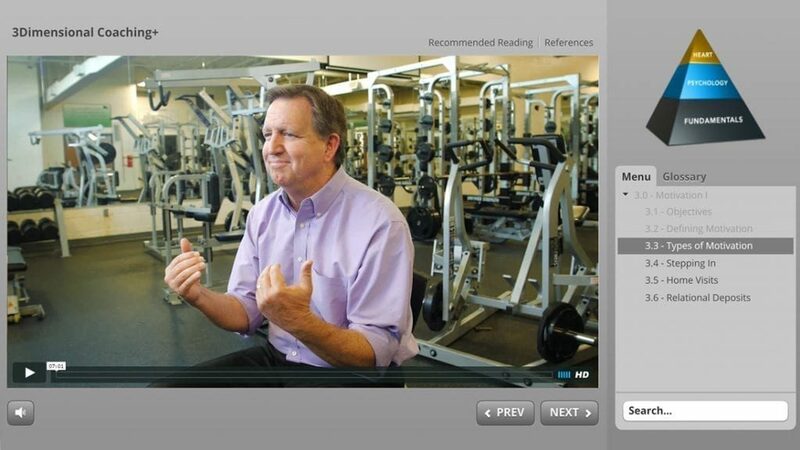 I have coached for 10 years, read "3D Coaching" 3 times, but this course was a grand-slam. The video footage was excellent. Jeff, Wes, and Mark did an excellent job with their communication. I absolutely loved the + videos by the FCA staff. The 3D Coaching philosophy can change and impact society in a way that is unique and relevant. This course exceeded my expectations and I am so encouraged to have this training as a part of my coaching ministry. Applying the information taught in this course can help change the culture of your program. 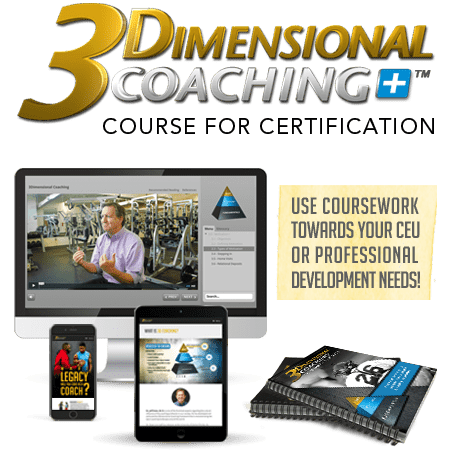 Your athletes will be grateful you embarked on this 3D coaching journey. 3D Coaching brings to life the thought patterns that are imbedded in the heart of every coach that desires to bring out the best in the athletes under their care! This course was awesome and was exactly what I needed for this team and myself! I give 5 thumbs up and highly recommend it. One of the most informative, invigorating , helpful and Christ centered experiences in my life! Extremely grateful for the high quality of all the teachers. This course taught me to be intentional in coaching in all three dimensions so that I can have a positive influence in my player's lives. This course has given me much information that can help me as a coach. Most important is that it has transformed me into a transformational coach. I thought this course brings up some very valid points for not only building a successful program, but also maintaining it throughout the course of many years. I really enjoyed going through the 3D coaching training. It has helped me grow not only as a coach but as a person. I found this course to be very eye opening and I believe it was structured very well. I find the video teaching interesting and easily accessible. I have learnt and gained confidence to be a more than just sports coach. And on top of that, to be a life coach to my players, sports can truly be a transformational tool in lives of sportsman; redeeming what is good and beautiful in sports and in life. To help my players to be good and honourable leaders in the society and in the church. 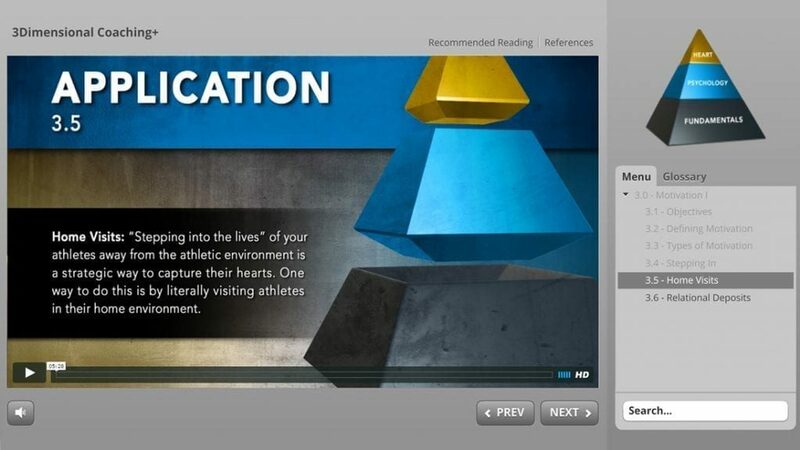 As a teacher/coach at a Christ centered school, I believe this course should be a requirement for every coach. To create a community that walks with Christ together, fights like warriors for each other, gains wisdom from one another, and disciple the young men and women of the future. How awesome would that be! This course was very motivational and encouraging. I truly appreciate how it teaches coaches to not only acknowledge their athletes 2nd and 3rd tier, but to value and develop those as much as, or more than the 1st tier. I feel called to teaching and coaching because I already have faith in Jesus Christ and the relationship that I have with Him, but also how I am supposed to reflect that to those around me. This is a priceless tool to help lead me and provide resources to help me succeed in the most important part of being a coach....reflecting the love of Jesus Christ. This course challenged me to look at how and why I coach and to consider the impact I am having on my athletes. I challenge every coach to participate in this course . I took this course for a coaching class I am in at Evangel University. I plan to go into Strength and Conditioning and this helped out tremendously. I will be able to have a plan set. I believe this will put me far ahead of the competition. There are many things I can take and apply for the betterment of our cheer program. It was great! I learned a lot. I learned so much about myself and things I can change to meet the needs of my players. I want them to be better and now I can help them thanks to 3D Coaching! I took this course before I started actually coaching and it has showed me so many different useful techniques for coaching that aren't just fundamentals. The modules are set up in a way that aren't confusing and don't take up a lot of time. I learned something from each one 🙂 I by far recommend every coach to take this course in order to benefit your team, your staff and yourself! I cannot wait to implement the things I have learned in this course when I coach. This course revolutionized everything I knew about my role as a coach. Before I took this course I was mostly a 1st dimensional coach. I knew I wanted to touch on the 2nd and 3rd dimensions, but didn't know how. This course further developed my understanding of why it's important to coach in the 2nd and 3rd dimensions and how to coach in those dimensions. In addition, the concepts I learned are not just for the athletic field, I have used them to change how I talk to my kids, what I teach them to value and how I encourage them. So, even if you're not a coach, their principles cross over to every area of your life and are something everyone should learn and know. This was an excellent course. I wish I had taken it years ago. Meaningful and life changing perspective. Simple to navigate and well put together to allow convenient self study. This is a good course! I have already used some of the strategies before taking this course, but I found new ones that I play to use. Loved every moment of it. ALL coaches need to learn to coach from all 3 dimensions so ALL coaches could benefit from completing this course! I am so excited for what the 3D coaching has done in my heart and mind as a coach. I know that God has called me to coach, and this course as given me the laser focus and increased my knowledge to help turn my talent into 10. This is a very good course, the insights you get from it motivate you to transform your coaching style. Exceptional! As a tip - I found that reading the 3d book before starting upon the course made the progression / flow far smoother - Highly recommended! The videos were laid out in conscience, meaningful segments. Applications share were insightful and helpful. As we continue on our life journey, we meet Kairos moments where we realize that change is possible. As 3Dimentional coaches, we move forward with great excitement, enthusiasm, and a passion for living out our defined purpose; and we re-engage life on a new trajectory that inspires the lives of others for good. This course brought our staff closer together, and helped my staff and I become better coaches. It has improved us in so many ways. I am very grateful for this program and recommend it to all coaches. This was a great course. I believe that not only as a coach will i use this, but also in the classroom. this is awesome. A great course that emphasizes the importance of acknowledging players as whole persons and focuses on coaching at the deepest, most impactful levels. This is a phenomenal course that uses facts from scripture, along with research, and core values to help coaches recognize challenges, create life aplication strategies, and solutions that build successful leaders through relationships. I am really glad I took this course. It will help me be a better leader in both the sporting and business world. The course helped me better understand the "whole" student-athlete and ways to reach them in all three areas. Having recently retired after serving as a head men's basketball coach at the community college level for 26 years, taking this course provided confirmation as to why I achieved so much success as a mentor. 3Dimensional Coaching knocks it out of the park and gives true meaning, value, and significance to my long tenure as a leader! This was a quality experience, I enjoyed the teachings from all of the 3D coaches. It was a very empowering process and I plan on incorporating this into my daily activity. I read several books each off-season and this is by far the best course I have ever taken. Invest your time in this and it will transform your coaching career. I'm a veteran coach. All this stuff is spot on and anyone that has been coaching for a while knows it. It gave me some more good ideas to add to what I already have in place. Just like the athletes and the coaches, the program has to continue to evolve/change/adapt to meet each new year. This course has definitely transformed how I think about coaching. It has also given me many tools to help reach the student athletes where they are to grow in the sport, but more importantly in who God has created them to be. This course was a great way to transform the way I view and practice coaching. Also a great motivator when it feels like you've hit a wall in coaching. I hope to review parts periodically so I don't overlook or forget important parts of this course. This course has helped me to think differently about my coaching. I am what I would consider an experienced coach but the issues discussed here have me re evaluating what I will focus on in my upcoming season. I have traditionally been a coach who cares but this has reinforced the necessity to get back to the 2nd and 3rd dimension ideals with my teams. A truly inspirational and eye-opening course worth every minute. It's a platform you can use to reform your athletics program. Great strategies for becoming not only a great coach, but a great person. 3Dimensional Choaching? What a great course! During this time I put in practice with my athletes this principles and values and - WORK! My dears, I give thousands thanks for this course! Great course, outlines how to move beyond level one / fist dimensional coach in a clear and concise manner. This course was beneficial to me. I liked being guided through creating my transformational purpose statement. I also appreciated the FCA add-ons. This course was a clear, concise instruction with practical and relatable tools and stories to guide coaches in finding purpose and value in coaching and building a foundation that will help our athletes, communities and our world. There has been a huge need to coaches training and development for a long time. I am so thankful to have this resource for our coaches at our school. We hope that every coach at our school will be trained the 3D way by next year so we can all encourage each other in our quest to transform lives. I am grateful for the opportunity to take this course. It opened my eyes and helped me realize the importance and care necessary to be a 3D coach. I advise this course to every coach. There is something in there that every coach can find beneficial. I am forever changed in a positive way because of this course. Thanks 3D! This is a course of study that will change the course of a community. It starts with one, then a group, then a team, then a community. What a true gift from God: Live Changed. The course was well organized, and straightforward. I found the subject matter to be very pertinent concerning the coaching methodology for today's athletes. I was pleased to see references, and recommended reading contained in the modules, which aids in digging a little more deeper on a particular topic(s) of interest. along with a book I read by I. Balyi, R. Way, and C. Higgs: Long Term Athletic Development; A guide to developing a philosophy of sport for life, training frameworks, a consistently successful organization. I'd recommend this course to coaches of any sport, at any level. After 30 years of doing this basic type of coaching, this course puts it together for me. Gives me an instruction plan, confirms what have given thought to but most importantly, it fills in the gaps and answers questions that I had no answer to. Very good reminders of why and how we coach. I really enjoyed how this course challenged me and helped me become a better husband, father, teacher, and coach. My first question is... Where was this program 33 years ago when I started coaching? It would have helped me tremendously in poring into the lives of athletes in a positive way instead of the way I did for so many years. This is a great course. It really makes you look introspectively at yourself and analyze how well your are really doing. I was able to get a lot out of the course and there were some great ideas shared that I plan on implementing with my own team. This course is an excellent coaching development tool for any coach of any age and at any level. It can be helpful in just one aspect of your coaching career or every aspect of your career depending on how you want to and plan to use it. It is by far the best tool to help coaches get beyond the fundamental first dimension of coaching and help them to learn how to deeply impact their athletes lives at the 3rd dimensional heart level! I am looking forward to the journey and HIGHLY recommend 3D coaching to all coaches! I felt the course was very important in the transformation of myself as a coach. It helped me realize that I am not alone in this process and that with a focused mindset, I will be able to transform myself into a 3rd dimension coach. I believe the course was wonderful. It kept me thinking and not only applying the concepts to coaching but to life as well. 3Dimensional Coaching is a system for self-reflection and helps everyone remember the reason they do what they do. It also provides practical, usable strategies to make a difference in the lives of everyone you come in contact with daily. I thought the course was very informative. There were lots of good ideas and suggestions. I think implementing these will be very beneficial to our program. The " intentionality nature " and the results outcome at the end of this 3D coaching journey is what really made this course extraordinary. To have coaches feel that kratos moment and have them embrace it by inspiring them to formulate and write their very own transformational statement, is influence and impact at its strongest. The strategies made available and the tools on how to organize and plan for them is really impressive. I'm excited to be the 3D coach I can be for my student-athletes and can't wait to start the journey to building a lifelong purposeful legacy not only for me but for out community. This course is both an eye opener and a check up of ones very philosophy. I highly recommend this to my friends and coaches who also desire to be life changers. This course reminded me of why I coach and renewed my attitude in that it's not about the first dimension, it's about shaping these athletes into outstanding adults. It's about love, community, and integrity. I greatly enjoyed this course and highly recommend it. Great course. Relies on positive thinking and action a lot. Many coaches operate at Level 1 only. Maybe we can have a summary/explanation to give them so they can understand what they are doing wrong! I liked the course. It was very long and a definite time commitment. Leaders should be advised to begin this course long before the season starts so that it can be completed before the season begins so things can really be implemented. Really enjoyed the stories and past experiences of former coaches. This course helped streamline my thoughts and passions of coaching and mentoring into a concise process involving strategies and goals i may never have found on my own. What is the difference between the course for certification and the course for college credit? If a student wants to receive college credit for taking 3Dimensional Coaching, he/she must enroll in that version of the course. The cost is $450 for 3 hours of transcripted college credit (graduate level), whereas the cost is only $115 to take the course for certification. 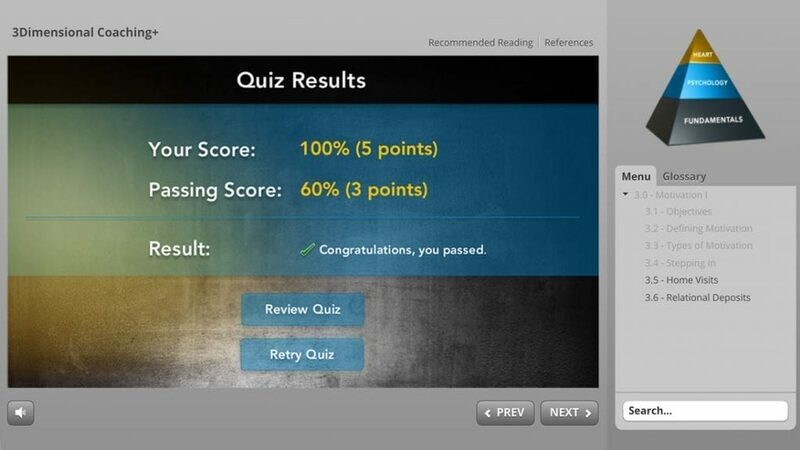 The course for college credit has an additional unit utilizing Joe Ehrmann’s book InSideOut Coaching, while the course for certification does not include this extra work. What is the difference between 3Dimensional Coaching and 3Dimensional Coaching ? The version of the course for certification contains the same modules, learning objectives, videos, quizzes, exercises and planning tools as the standard version. 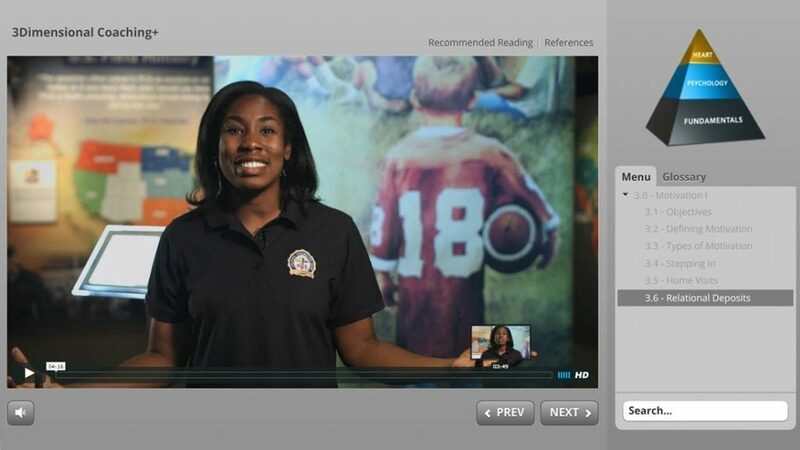 The difference is that it provides short faith-based video teachings at the end of each module that help coaches explore the topic at hand through the lens of their faith. These add-ons are provided by FCA, a level 3 partner of the 3D Institute. If I choose the Course for Credit option, will I still receive my 3D Coaching certificate? Yes. Whether you are taking a course for certification only, or the course for certification AND college credit, you will be mailed a hard-copy of your certificate once you complete your coursework. Can I use this course to satisfy CEU’s and/or professional development requirements? Because our curriculum is based on the academic research of Dr. Jeff Duke E.D.d., and the content is taught in the university setting at both the undergraduate and graduate levels, school districts and athletic organizations should have no problem counting this coursework towards professional development requirements. Check with whomever is in charge of professional development in your organization to inquire, and let us know how we can help you get it approved. I’m an administrator and I want ALL of my coaches to be certified. How do I get them enrolled? We have many school districts, clubs, and athletic organizations who require their coaches to be 3D certified. This process is easy. Simply reach out, let us know how many licenses you would like to purchase, and we will set up a unique code that will allow your coaches to enroll in the course at no cost to them. We will then send you an invoice, and you can pay for them all at once out of your athletic budget, professional development budget, or with donated funds from sponsors. As an administrator, we will give you tools to help guide your coaches through this journey and set you up with account access so you can monitor their progress. Once I enroll, am I on a time limit to complete the online course? You set the pace for your coursework. If you are taking the course for certification only, there is no deadline unless you are in a situation where a supervisor establishes one for you. However, if you are taking the course for credit and you want to receive your grade at the end of the current trimester, you must complete your coursework in correspondence with the university academic calendar. If you don’t complete the work within the trimester, you can simply keep working at your own pace until you finish. Once you are done, you will receive your grade. Do I have to buy the Companion Study Guide to receive my certification? No. Though we feel that it is the best practice to use the Companion Study Guide to enhance your learning experience, it is not required to receive your certificate. Keep in mind that if you are using the coursework to count towards professional development requirements, the study guide will allow you to engage with the 3D training for many more clock hours than the online training alone. This should translate to more CEU’s, recertification points, etc. How do I use the Companion Study Guide? The Companion Study Guide will help chronicle your journey through the 3D Coaching online training. This spiral-bound book can be used as a journal to take notes from the online training. Also, it can serve as a quick reference guide to remind you of key teaching points that were presented in the video teaching. However, we believe the best way to use this resource is in the context of community with others. 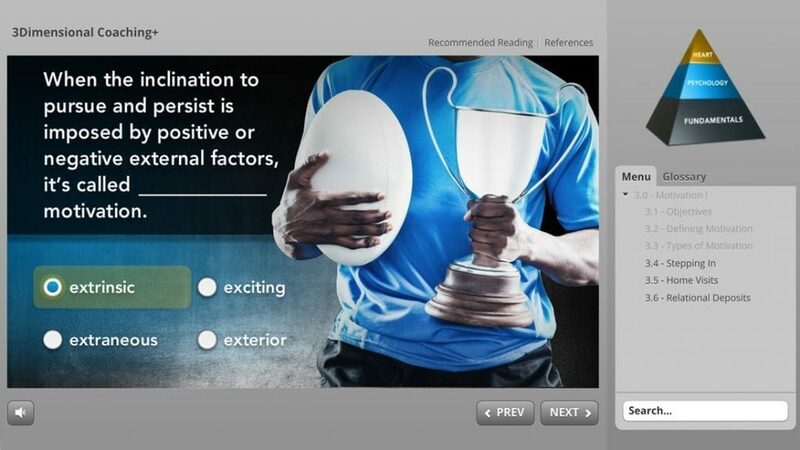 Each chapter corresponds with an online module and has thought provoking questions that allow coaches to discuss and process the content with each other. 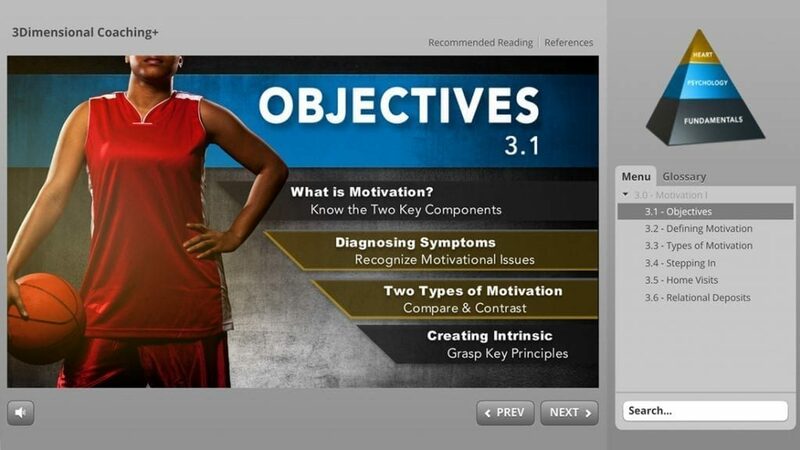 Coaches can watch the video modules on their own, then get together to discuss using the Companion Study Guide in small groups. Can the Companion Study Guide be used to complement ANY version of the course? Yes. Whether you are taking one of the courses for certification only, or the course for certification AND college credit, the Companion Study Guide will correspond with the training you experience online. However, if you are taking the course for credit, the extra coursework associated with Joe Ehrmann’s book InSideOut Coaching is not associated with the Companion Study Guide in any way. If my school district/organization is requiring me to be certified in 3D Coaching, can I enroll in 3Dimensional Coaching ? Yes, unless your supervisor tells you otherwise. Because the 3D Coaching portion of the training is identical in both versions, you will experience the same learning objectives regardless of which version you choose. 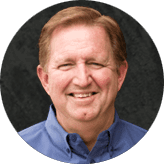 By enrolling in the version, you are simply opting to have access to an additional 1.5 hours-worth of faith-based content that is complementary to the 3D training. This content has been provided by FCA, a level 3 partner of the 3D Institute. Does the Companion Study Guide and the Companion Bible Study cover the same content? Though they both follow the same topical outline, the content in each resource is different. The Companion Study Guide corresponds to the online 3D Coaching training modules and the Companion Bible Study corresponds to the faith-based add-ons in the version. How is the Companion Bible Study meant to be used? Although this resource can be used individually by coaches who are going through 3Dimensional Coaching , it was designed by FCA with the intent for coaches to use in Coaches’ Huddles. What is the relationship between 3D Institute and FCA? FCA uses 3Dimensional Coaching as their framework for training coaches. FCA has licensed the content from 3D Institute and partnered to develop faith-based resources that complement the 3D training. FCA - "A Level 3 Partner"
As coaches take the 3D journey, oftentimes it leads to deep reflection upon issues of identity, significance, and purpose. When coaches begin to process these deeper issues of the heart, it can easily lead to discussions that are faith-based in nature. Because the 3D Institute does not specialize in helping coaches process these 3rd dimension issues from a faith-based perspective, we have identified FCA as a "Level 3 Partner" who can come alongside coaches in their faith journey. FCA has been about the business of serving coaches in their spiritual journey for over 60 years, and we count it as a great privilege to have such a great "Level 3 Partner."